During World War II, the division was credited with many "firsts". It was the first United States division to deploy as an entire unit overseas and among the first of seven U.S. Army and U.S. Marine units to engage in offensive ground combat operations during 1942. The division was among the first divisions to engage the enemy and were still fighting holdouts after the official Japanese surrender. The 32nd logged a total of 654 days of combat during World War II, more than any other United States Army division. The unit was inactivated in 1946 after occupation duty in Japan. The 32nd Division arrived on the Western Front in February 1918. 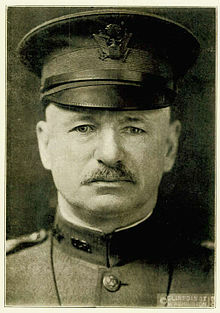 The 32nd was the sixth U.S. division to join the American Expeditionary Force (AEF), under General John J. Pershing. The unit's morale was temporarily lessened when they learned they were assigned to create a depot for I Corps that would train replacement soldiers. Major General Haan reminded his commanders that it was every soldier's duty to contribute their best to the war effort, including training replacements. However, Haan lobbied Pershing and after several stormy sessions, finally convinced him that the 32nd could hold its own as a division. Up to this point much of the war had been a stalemate, fought from static trench lines over the same few kilometers of terrain. Over the next six months, the division was under constant fire, with only 10 days rest. The division took a leading role in three important offensives, fighting on five fronts, suffered more than 14,000 casualties, captured more than 2,000 prisoners, and never yielded ground to the enemy. Major General James Parker had re-assumed command on 7 December 1917, and led the unit into Alsace in May 1918, attacking 19 kilometers (12 mi) in seven days. During the Battle of Marne, they captured Fismes. The only American unit in French General Charles Mangin's famous 10th French Army, it fought between the Moroccans and the Foreign Legion, two of the best divisions in the French army in the Battle of Oise-Battle of Aisne offensive. 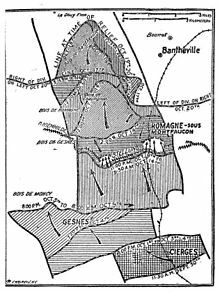 The 10th Army took Juvigny. In the five-day battle against five German divisions, the 32nd suffered 2,848 casualties. Moving out of their trenches, the division fought continuously for 20 days during the Meuse-Argonne Offensive. The division was the front line element of the Third U.S. Army. The Germans were well dug in after four years of trench warfare and had orders to hold the line at all costs. On 14 October at 5:30 am, the division broke through the maze of barbed wire and took the line of trenches forming the Hindenburg Line and moved on to the last German stronghold at Kriemhilde Stellung, where they reached the Meuse River. The 32nd was the first Allied Army unit to penetrate the Hindenburg Line. They then captured Côte Dame de Marie, the key to all the defenses in the area. Over the next five days the division continued to advance while under nearly constant machine gun and artillery fire. The 32nd Division defeated 11 German divisions in the Argonne fighting, including the fearsome Prussian Guards and the German Army's 28th Division, known as Kaiser's Own. The offensive cost the division 5,950 casualties. Their next objective was to flank the Germans at Metz and they marched 300 kilometers (190 mi) to the Rhine River. There they occupied the center sector in the Koblenz bridgehead for four months, during which they held 400 square kilometers (150 sq mi) and 63 towns. The division fought in three major offensives, engaging and defeating 23 German divisions. They took 2,153 prisoners and gained 32 kilometers (20 mi), pushing back every German counterattack. During the drive to capture Fismes, they successfully attacked over open ground at great cost. When the division was federalized on 15 October 1940, it was made up of National Guard units from Michigan and Wisconsin. It was authorized to have a peacetime strength of about 11,600 soldiers, but like almost all units in the National Guard and the Regular Army prior to World War II, was not at full strength nor was it assigned all of the equipment it was authorized. Training for many soldiers was incomplete. The division was scheduled to receive a year of training. In October 1940, the division began a six-day motor march to Camp Beauregard, Louisiana. On 26 January 1941, the 32nd Division relocated to the recently completed Camp Livingston, about 15 miles (24 km) northeast of Alexandria, Louisiana. The unit then spent the next 16 months training in Louisiana. During the summer of 1941, the division moved to Camp Beauregard, Louisiana. as part in the Third and Fourth Army maneuvers—nicknamed the Louisiana Maneuvers—which provided the army high command a good look at the preparedness of the regiment. The first test, which was held in the vicinity of Camp Beauregard, was conducted 16–27 June and included the 32nd Division as well as the 37th Division from Ohio. From 16–30 August, the maneuvers expanded to include the 34th and 38th Divisions. During September, the largest maneuvers were held with the Seventh Corps of the Second Army, opposing the Fourth, Fifth, and Eighth Corps of the Third Army. The Grand Rapids Guard was part of the Fifth Corps. It was the largest maneuver of its kind in the history of the Army and included some 100,000 men. National Guard units were at the time not required to serve active duty outside of the western hemisphere and draftees were inducted for a maximum of one year of service. But on 7 August 1941, by a margin of a single vote, Congress approved an indefinite extension of service for the Guard, draftees, and Reserve officers, including the Red Arrow Division. After the Attack on Pearl Harbor, the division was one of the first activated for federal duty. The division was initially ordered to prepare for an early departure overseas to Europe and the division moved to Fort Devens, Massachusetts, for transport to Northern Ireland. The 107th Engineer Battalion left Camp Livingston on 2 January 1942, and was shipped by train to Fort Dix, New Jersey, where it lost its 2nd battalion and was redesignated the 107th Engineer Combat Battalion. The 107th was shipped ahead of the rest of the division as an advance party so they could prepare an overseas camp for the division's arrival. The rest of the division was to have three months to prepare for embarkation to the front in Europe. However, Japan had rapidly advanced into the South Pacific, progressively occupying an increasing number of islands. Japan was evidently intent on cutting Australia off from its American supply lines, and Australia feared that Japan was planning to invade. Prime Minister John Curtin demanded the Allies release Australian troops from the Mediterranean and North Africa front to defend their home. The United States initially sent the 41st Infantry Division, less one regiment, from where it was training at Ft. Lewis, Washington. The 41st Division arrived in Melbourne on 6 April 1942. Though the Allies released the Australian 6th and 7th Divisions, the 9th could not be spared. In a compromise, the 32nd was notified on 25 March, less than six weeks after Harding was placed in command, to turn around and ship out west to the Pacific instead. Harding was told the entire unit was to be ready to board ships in San Francisco in only three weeks. Implementing these orders cost the division's preparedness a great deal. The 35th Division was designated to replace the 32nd Division for shipment to England. The 114th Engineer Combat Battalion, a National Guard unit from New England, was hurriedly redesignated and assigned to replace the 107th Engineers, who were already in the middle of the Atlantic bound for Ireland. On June 1, 1942, the original 107th Engineer Combat Battalion was redesignated the 2nd Battalion, 112th Engineer Regiment; on August 19, 1943, at Saunton Sands near Camp Braunton, England, the 2nd Battalion, 112th Engineers was redesignated as the 254th Engineer Combat Battalion. On 22 April 1942, just before the division boarded ships in San Francisco bound for Australia, they received about 3,000 additional soldiers, most of whom had just finished basic training, to fill in their incomplete ranks. The division was still missing about 1,800 men. The division had to make do with whatever equipment was found in depots near San Francisco. Not even its firearms allocation was complete; it could not obtain any compact M1 carbine rifles meant for officers and support forces, forcing the division to arm them with the regular infantry's longer, heavier yet more powerful M1 Garand. They traded in their World War I – era horse-drawn artillery pieces for new 105mm M101 howitzers, though they received scant training on the new guns. After eight days waiting for transit, the division returned to San Francisco and boarded a convoy of seven Matson Line ships, including the S.S. Lurline and USS Hugh L. Scott at Pier 42. The convoy (SF 43) was escorted by the cruiser USS Indianapolis and two corvettes. Four days out of San Francisco, the Lurline ship's crew discovered the division's mascot, a dog named Vicksburg. She was named for the town she was born in and the location of the final major campaign of the American Civil War. (Vicksburg was killed in a road accident in Southport, Australia on 8 October 1942). A monument to the dog still exists at the former entrance to Camp Cable. Although the 32nd had spent a good deal of time training in Louisiana with considerable swamp close at hand, their destination at that time was Europe. Most official records state that the men had little additional training for jungle conditions while in Australia. General Eichelberger, MacArthur's Chief of Staff, wrote that "In Washington I had read General MacArthur's estimates of his two infantry divisions, and these reports and our own inspections had convinced my staff and me that the American troops were in no sense ready for jungle warfare." However, some veterans interviewed report they received general training with weapons and practice at terrain maneuvers, and in jungle warfare. They said this increased once the unit arrived in Brisbane. Less than two months after their arrival in Australia, the unit was moved in July 1942 halfway across Australia, 1,223 miles (1,968 km) northeast to Camp Tamborine, about 50 kilometers (31 mi) south of Brisbane on Australia's east coast. The majority of the division and its equipment was split up and shipped by railroad, while some were transported on five Liberty Ships. Each Australian state had a different rail gauge (or width), and the equipment and men had to be offloaded at each state's boundary and reloaded onto a new train. The division's trains crossed four states before it reached Brisbane. On Guadalcanal, Lieutenant General Harukichi Hyakutake's initial thrust to re-take the island's Henderson Field had been badly defeated. Meanwhile, a landing at Milne Bay had also been repulsed. :230 With the concurrence of the Japanese command staff, he ordered General Horii to withdraw his troops on the Kokoda Track until the issue at Guadalcanal was decided. :162–193 On 28 September, General Horii and his troops began to hastily withdraw northward over the Owen Stanley Mountains to Kokoda and then to Buna–Gona. The Australian Army units on New Guinea were under increasing pressure from the Japanese forces who had advanced within 32 kilometers (20 mi) of Port Moresby. Anxious to blunt the Japanese attack, and although no white man had crossed using that route since 1917, General Douglas MacArthur issued orders for United States forces to take the Kapa Kapa Trail running parallel to the Kokoda Track. The 32nd's Divisional Headquarters and two regimental combat teams formed around the 126th and 128th infantry regiments were deployed to Port Moresby between 15 and 29 September 1942. Lead elements of the 126th finally crossed the 2,800-meter (9,200 ft) gap near Mount Obree, which they nicknamed Ghost Mountain, where all of the remaining native porters abandoned the Americans, leaving them to carry their own equipment. On 20 November 1942, after almost 42 days on the trail, crossing exceedingly difficult terrain, including hogback ridges, jungle, and mountainous high-altitude passes, E Company was the first to reach Soputa near the front. The remainder of the battalion trickled in over the next few days. :109 As a result of the extremely difficult march and the decimated ranks of the unit, the battalion earned the nickname of The Ghost Battalion. :378 No other troops were tasked with making the same trek. Two weeks later the remainder of 128th RCT was flown to Wanigela near the Buna where they joined the Australian 18th Brigade. They were to begin an assault on 16 November 1942 on the main Japanese beachheads in eastern New Guinea. The 32nd Division was among the first of all US divisions to engage in a ground assault against the enemy in World War II. General Harding was nearly killed before the attack began. The first day of the assault, Harding was on board a sixty-two foot wooden coastal trawler, the Australian civilian crewed Minnamurra that was operating as part of the U.S. Army's Small Ships Section, with his headquarters company when it and its convoy carrying important artillery and supplies was attacked by Japanese fighter-bombers. Harding saved himself by diving overboard and swimming to shore. The attack destroyed all five vessels and the supplies Harding was relying on for the upcoming attack. More were sunk over the following days or ran aground. General George Kenney wielded a great deal of influence over MacArthur, and although he had no knowledge of jungle warfare, insisted that tanks had no role in ground action in the jungle, but that the "artillery in this theater flies." Harding reluctantly accepted MacArthur's decision to go ahead with the attack and to rely on direct air support in place of tanks or heavy artillery. The Japanese were now commanded by Maj. Gen. Kensaku Oda, who succeeded General Horii, who had drowned in the Kumusi River:248 while retreating from their initial attack across the Kokoda Track on Port Moresby. The Japanese at Buna-Gona were unable to dig deep trenches or shelters due to the .91-metre-deep (3.0 ft) water table. Instead, they built hundreds of coconut log bunkers. :246 These had mutually supporting lines of fire and were organized in depth. The bunkers were often linked by trenches allowing the Japanese to move at will among them, reinforcing one another. Buna was General Douglas MacArthur's first ground offensive campaign against Japanese troops in World War II. He received intelligence from Brigadier General Charles Willoughby, who told MacArthur before the operation that there was "little indication of an attempt to make a strong stand against the Allied advance." Other intelligence he received led him to believe that Buna was held by about 1000 sick and malnourished soldiers. Unfamiliar with the state of Japanese defenses, Lieutenant General Richard K. Sutherland, MacArthur's chief of staff, glibly referred to these fortifications as "hasty field entrenchments." U. S. Air Force historian Stanley Falk wrote, "The Papuan campaign was one of the costliest Allied victories of the Pacific war in terms of casualties per troops committed. "[page needed] Of the 9,825 men of the 32nd Division who entered combat, the division suffered 2,520 battle casualties, including 586 killed in action. More telling was the huge number who were casualties due to illness: 7,125 (66%, with 2,952 requiring hospitalization), and 100 more died from other causes. The total casualty count of 9,956 exceeded the division's entire battle strength. The Ghost Mountain Boys of the 2/126th were especially hard hit. When Buna was taken they finished the fight with only six officers and 126 troops standing out of the 900 plus who had started out from Kapa Kapa. The extremely difficult 210-kilometer-long (130 mi) march by the U.S. 2/126th from Kapa Kapa to Jaure and the brutal combat at Buna-Gona taught the Allied armies important lessons that they applied throughout the Pacific Theater and remainder of the war in the Pacific. The Battle of Leyte was the invasion and conquest of Leyte in the Philippines by American and Filipino guerrilla forces under the command of MacArthur. The U.S. forces fought Japanese Army forces led by General Tomoyuki Yamashita. The battle took place from 17 October to 31 December 1944 and launched the Philippines campaign of 1944–45, the goal of which was to recapture and liberate the entire Philippine Archipelago and to end almost three years of Japanese occupation. The 32nd was in reserve and was not deployed to Leyte until 14 November when it was assigned to the US X Corps. It relieved the 24th Infantry Division and went into action along the Pinamopoan-Ormoc highway, taking Limon and smashing the Yamashita line in bitter hand-to-hand combat. The division linked up with elements of the U.S. 1st Cavalry Division in the vicinity of Lonoy, on 22 December, marking the collapse of Japanese resistance in the upper Oromoc Valley. The division remained on the front lines until the Japanese resistance on Leyte was broken near the end of December. On 28 May it met the 25th Infantry Division near Santa Fe, securing Balete Pass, the gateway to the Cagayan Valley. While elements of the division continued mopping-up activities near Imugan, other units moved to rest and rehabilitation centers. Active elements secured the Baguio area, wiped out Japanese forces in the Agno River Valley area, and opened Highway 11 as a supply route. They captured General Tomoyuki Yamashita, who surrendered on 2 September 1945, in Kiangan. "It was a great moment for the 32nd," wrote Maj. Gen. William H. Gill, commanding general of the Red Arrow Division, "a glorious finish to this long bitter struggle." At Saidor, they became the first U.S. division to make a beach landing in the New Guinea Campaign. They were the first to employ General MacArthur's "by-pass strategy," leaving some Japanese units alone and attacking behind them to cut them off from their lines of supply. In the battle for Aitape, they were the first division to simultaneously supply 11 battalions in combat in one action completely by airdrop. Later on, in the Battle of Leyte, they were the first to supply four infantry battalions for two days from artillery liaison "Cub" planes. They were the first to publish an American servicemen's letterpress newspaper (the Stalker) in the Southwest Pacific. Finally, elements of the 32nd Division were among the first American occupation troops to land in Japan. In 1949, U.S. Air Force General George Kenney published General Kenney Reports, a personal history of the air war he commanded from 1942 to 1945. In it he praised Australian Generals George Vasey and George Wootten, commanders of the 7th and 9th Divisions, but he also criticized Australian Lieutenant General Sydney Rowell, who was dismissed by General Edmund Herring for insubordination. :219 He said Rowell had a "defeatist attitude." Of the U.S. 32nd Division, he said the troops "were green and the officers were not controlling them." He quoted General Herring and Major General Sir Thomas Blamey as critical of the 32nd's efforts. Kenney said the 32nd sat in the jungle for 10 days "doing nothing but worrying about the rain and the strange noises at night." 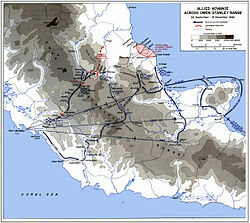 When [a] bold and aggressive enemy invaded Papua in strength, the combined action of ground and air units of these forces, in association with Allied units, checked the hostile advance, drove the enemy back to the seacoast and in a series of actions against a highly organized defensive zone, utterly destroyed him. Ground combat forces, operating over roadless jungle-covered mountains and swamps, demonstrated their courage and resourcefulness in closing with an enemy who took every advantage of the nearly impassable terrain. Air forces, by repeatedly attacking the enemy ground forces and installations, by destroying his convoys attempting reinforcement and supply, and by transporting ground forces and supplies to areas for which land routes were non-existent and sea routes slow and hazardous, made possible the success of the ground operations. Service units, operating far forward of their normal positions and at times in advance of ground combat elements, built landing fields in the jungle, established and operated supply points, and provided for the hospitalization and evacuation of the wounded and sick. The courage, spirit, and devotion to duty of all elements of the command made possible the complete victory attained. The division was recreated within the Army National Guard after the end of the Second World War in 1946. In 1954, it comprised the 127th, 128th, and 426th Infantry Regiments, 120th, 121st, 126th, and 129th Field Artillery Battalions, 132nd Antiaircraft Artillery Battalion, 132nd Tank Battalion, and other units, including the 724th Engineer Battalion. On 6 September 1961, with the heightening of the tensions due to the Berlin Crisis, the 32nd Infantry Division was alerted to an impending call-up. The commanding general, Major General Herbert A. Smith was notified a few days later that the division was to report on 15 October 1961 to Fort Lewis, Washington, for active duty. This was exactly 21 years after their activation date for World War II, at which time then Lt. Col. Herbert A. Smith had been commander of the 2nd Battalion, 128th Infantry. The unit served until August 1962 at Fort Lewis, Washington, and was assigned to the Strategic Army Command. The division began training as replacements for the 4th Infantry and the 2nd Armored Divisions at Fort Lewis, Washington, and Fort Hood, Texas, in case they were deployed overseas as reinforcements for the Seventh Army in Germany. They returned to Wisconsin without being deployed overseas. Several people who served in the division gained notability during and after their time in the division. In World War I, PFC Joseph William Guyton (1889–1918), became the first American killed on German-held territory, earning him the French Croix de guerre. During World War II, notable members of the division included Captain Herman Bottcher, awardee of two Distinguished Service Cross Medals, Captain William "Bill" Walter Kouts and Private John Rawls awardee of a Bronze Star who later became a political philosopher. 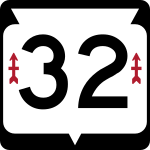 Wisconsin Highway 32 (WIS 32), as well as a portion of former U.S. Route 12 in Michigan (now Red Arrow Highway), are named in honor of the 32nd Infantry Division, and all WIS 32 markers carry the Red Arrow insignia. A memorial plaque describing the division is located at southern end of WIS 32 on Sheridan Road in Kenosha County, Wisconsin. Ceremonies were held along the route and included veterans of the Grand Rapids Guard, which had been part of the Thirty-second Division during both world wars. Lowell High School in Lowell, Michigan, adopted the nickname Red Arrows in honor of the 32nd Infantry Division shortly after their return. 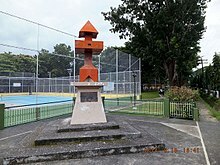 A memorial to the division was built in San Nicolas, Pangasinan, Philippines. 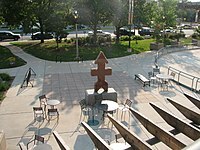 Milwaukee built the Red Arrow Park dedicated to the men of the 32nd Red Arrow Division who came from Wisconsin following World War I. When Interstate 43 was built over the site, the park was relocated to a site just north of Milwaukee City Hall at E. State Street and N. Water Street. On 11 November 1984, the city dedicated a red granite at the park. The base of the monument is inscribed "Les Terribles". The Red Arrow Park in Marinette, Wisconsin, was built in memory of the 32nd Division. Veterans of Foreign Wars Post #1527 "The Red Arrow Post" in Portage, Michigan is named in their honor. ^ a b c d e "The 32nd Division in World War I: From the "Iron Jaw Division" to "Les Terribles"". The 32nd 'Red Arrow' Veteran Association. Archived from the original on 25 February 2009. Retrieved 17 February 2009. ^ a b Hubbuch, Chris (11 November 2008). "Remembering Wisconsin's citizen soldiers". La Crosse Tribune. Archived from the original on 1 January 2017. Retrieved 4 April 2009. ^ a b c d "Michigan National Guard in World War II". State of Michigan. Archived from the original on 26 December 2012. Retrieved 14 November 2012. ^ "Wisconsin National Guard Museum". Wisconsin Veterans Museum Foundation. Archived from the original on 19 August 2008. Retrieved 10 August 2016. ^ "Division History: 32nd Infantry Division". Archived from the original on 4 March 2016. Retrieved 3 December 2014. ^ a b c d e f g Department of Military and Veteran's Affairs. "World War I". Archived from the original on 28 December 2008. Retrieved 31 January 2009. ^ a b c d e "Birth of the Thirty-Second Division". Retrieved 12 February 2009. ^ a b "1st Battalion – 120th Field Artillery Regiment". Archived from the original on 19 November 2008. Retrieved 7 February 2009. ^ a b "Marshall Beattie and the Red Arrow Division". Archived from the original on 13 February 2009. Retrieved 6 July 2009. ^ a b c d Nolan, Jenny (13 September 1997). "The Red Arrow Division: Fierce fighters of the first World War". The Detroit News. Archived from the original on 23 October 2012. Retrieved 10 October 2012. ^ "Brief History of the "Red Arrow" From the 32nd Division to the 32nd Infantry Brigade". The 32nd 'Red Arrow' Veteran Association. Archived from the original on 13 February 2009. Retrieved 22 February 2009. ^ a b c d e "Highlights of the 32nd Infantry Division "The Red Arrow" in World War II". The 32nd 'Red Arrow' Veteran Association. Archived from the original on 16 February 2009. Retrieved 22 February 2009. ^ a b Frederick Stonehouse. "Combat Engineer! The History of the 107th Engineer Battalion (1881–1981)". Archived from the original on 5 September 2008. Retrieved 21 October 2008. ^ a b c Anderson, Rich. "US Army in World War II Introduction and Organization". Archived from the original on 7 July 2009. Retrieved 21 February 2010. ^ a b c d "Remembering the war in New Guinea: 32nd U.S. (Red Arrow) Infantry Division". Archived from the original on 16 September 2007. Retrieved 21 October 2008. ^ a b c Brockschmidt, Kelli. "The New Guinea Campaign: A New Perspective Through the Use of Oral Histories". McNair Scholars Journal. Grand Valley State University. 9 (1). Archived from the original on 28 December 2013. ^ a b c "The 32nd Infantry Division "The Red Arrow" in World War II". Archived from the original on 22 October 2008. Retrieved 20 October 2008. ^ a b c Samuel Milner (December 2002). Victory in Papua. United States Army in World War II, The War in the Pacific. United States Army Center of Military History. ISBN 978-1-4102-0386-1. Archived from the original on 12 April 2010. Retrieved 21 February 2010. ^ "The Kokoda Track: Ghost to Coast". Archived from the original on 15 September 2009. Retrieved 14 February 2009. ^ a b c d e Fenton, Damien (12 September 2003). "32nd US (Red Arrow) Infantry Division (Overview text)". Australian War Memorial. Archived from the original on 3 December 2013. Retrieved 17 November 2012. ^ "History of the 254Combat Engineers in World War II". Archived from the original on 22 April 2001. Retrieved 29 November 2014. ^ a b c Bagley, Joseph. "My father's wartime experiences: Francis G. Bagley, Company B, 114th Combat Engineers, 32nd US Infantry Division". Remembering the war in New Guinea. Archived from the original on 19 August 2008. Retrieved 8 February 2009. ^ a b c d e f g h Campbell, James (30 September 2008). The Ghost Mountain Boys: Their Epic March and the Terrifying Battle for New Guinea—The Forgotten War of the South Pacific. Three Rivers Press. p. 378. ISBN 978-0-307-33597-5. Archived from the original on 26 January 2018. ^ "Suburban histories: Yarrabilba". Logan City Council. 1 October 2008. Archived from the original on 30 April 2009. Retrieved 28 April 2009. ^ Dunn, Peter (7 August 2000). "Camp Cable". Australia at War. Archived from the original on 8 August 2009. Retrieved 28 April 2009. ^ "Vicksburg (mascot) B: Vicksburg, Mississippi Aug 1940 D: Southport, QLD, 8 Oct 1944 Camp Cable (memorial) Park, Beaudesert". Archived from the original on 23 December 2008. Retrieved 26 December 2009. ^ "Homminga, Wellington Francis (Interview outline and video), 2009". Veterans History Project collection, RHC-27. Grand Valley State University. University Libraries. Special Collections & University Archives. Archived from the original on 2 April 2015. Retrieved 19 September 2012. ^ "Camp Cable near Logan Village, south of Brisbane". 7 August 2000. Archived from the original on 21 December 2008. Retrieved 22 February 2009. ^ "Buna". Archived from the original on 29 August 2008. Retrieved 29 October 2008. ^ a b c d Keogh, Eustace (1965). The South West Pacific 1941–45. Melbourne: Grayflower. OCLC 7185705. ^ Smith, Michael T. (28 January 2003). Bloody Ridge: The Battle That Saved Guadalcanal. New York: Pocket. ISBN 978-0-7434-6321-8. Archived from the original on 26 January 2018. ^ "Papuan Campaign". Archived from the original on 6 January 2010. Retrieved 27 October 2008. ^ a b "World War II: Buna Mission". Archived from the original on 23 October 2008. Retrieved 4 February 2009. ^ "U.S. Army Divisions in World War II". Archived from the original on 28 September 2008. Retrieved 21 October 2008. ^ Samuel Milner (1957). "United States Army in World War II, The War in the Pacific. The Japanese Offensive Collapses". Archived from the original on 7 May 2009. Retrieved 15 November 2008. ^ a b Samuel Milner (1957). "United States Army in World War II, The War in the Pacific. Victory in Papua". Archived from the original on 7 May 2009. Retrieved 15 November 2008. ^ a b c Gailey, Harry (2000). Macarthur Strikes Back. Novato: Presidio Press. ISBN 0-89141-702-8. ^ "PNG Treks - Kapa Kapa Track -Getaway Trekking". Getaway Trekking. Archived from the original on 18 February 2011. Retrieved 9 September 2010. ^ Larrabee, Eric (2004). Commander in Chief: Franklin Delano Roosevelt, His Lieutenants, and Their War. Annapolis: Naval Institute Press. ISBN 1-59114-455-8. ^ Lunney, Bill; Finch, Frank (1995). Forgotten Fleet: a history of the part played by Australian men and ships in the U.S. Army Small Ships Section in New Guinea, 1942-1945. Medowie, NSW, Australia: Forfleet Publishing. pp. 20–24, 143. ISBN 0646260480. LCCN 96150459. ^ Budge, Kent G. "Harding, Edwin Forrest (1886–1970)". The Pacific War Online Encyclopedia. Archived from the original on 1 October 2011. Retrieved 4 February 2009. ^ "Papuan Campaign – The Battle of Buna". The 32D Infantry Division in World War II The 'Red Arrow'. Archived from the original on 6 August 2012. Retrieved 21 September 2012. ^ "Table of Strengths and Casualties during the Battle of Buna-Sanananda". The 32nd Infantry Division in World War II "The Red Arrow": The Papuan Campaign – The Battle of Sanananda. 15 March 1999. Archived from the original on 9 May 2008. Retrieved 10 March 2009. ^ "PNG Treks—Kapa Kapa Track—Getaway Trekking". Getaway Trekking. Archived from the original on 18 February 2011. Retrieved 9 September 2010. ^ Mages, Robert (25 October 2009). "One Green Hell". U.S. Army Military History Institute. Retrieved 9 September 2010. ^ a b c d e "Back to Australia – Rehabilitation and Training". The 32D Infantry Division in World War II "The Red Arrow". Archived from the original on 4 February 2012. Retrieved 27 February 2012. ^ Miller, John, Jr. (1959). "Cartwheel: The Reduction of Rabaul". United States Army in World War II: The War in the Pacific. Office of the Chief of Military History, U.S. Department of the Army. p. 418. Archived from the original on 19 February 2012. Retrieved 20 October 2006. ^ * Shaw, Henry I.; Douglas T. Kane (1963). "Volume II: Isolation of Rabaul". History of U.S. Marine Corps Operations in World War II. Archived from the original on 20 November 2006. Retrieved 18 October 2006. ^ Robert Ross Smith (1953). "The US Army in World War II: the approach to the Philippines (Chapters V to VIII)". Archived from the original on 18 February 2009. Retrieved 4 April 2009. ^ Fenton, Damien. "Remembering the war in New Guinea". Archived from the original on 16 August 2016. Retrieved 19 July 2016. ^ a b Ramos, Pedronio O. "San Nicolas, Pangasinan: Our Kind Of Town". Archived from the original on 7 May 2009. Retrieved 16 February 2009. ^ a b "Famous 32nd". The West Australian. 21 July 1945. Retrieved 15 January 2013. ^ "U.S. Army Divisions in World War Ii". Archived from the original on 5 March 2009. Retrieved 22 February 2009. ^ "Red Arrow Division Sets Combat Record". Red Arrow Division. 6 August 1945. Archived from the original on 4 November 2008. Retrieved 26 February 2009. ^ "Pearl Harbor To Guadalcanal, History of the Marine Corps Operations In World War II, Volume I, p. 284". Archived from the original on 28 March 2009. Retrieved 4 April 2009. ^ Milner, Samuel (1972). Victory in Papua. Washington, D.C.: United States Army Center of Military History. ^ Algeria-French Morocco. The U.S. Army Campaigns of World War II. United States Army Center of Military History. CMH Pub 72-11. Archived from the original on 5 April 2009. Retrieved 4 April 2009. ^ "WW II newspaper 32nd Red Arrow Division The Stalker". Worthopedia – Price Guide. Archived from the original on 9 February 2013. Retrieved 6 July 2009. ^ a b "His Song Marches On". Portage Daily Register. 30 June 2010. Archived from the original on 9 February 2016. Retrieved 6 February 2012. ^ [[ |Sayers, Stuart]] (1980). Ned Herring: A Life of Lieutenant-General the Honorable Sir Edmund Herring KCMG, KBE, MC, ED. K St J, MA, DCL. Melbourne: Hyland House . ISBN 0-908090-25-0. ^ "AIF Gets Full Praise For New Guinea". The Argus. 26 November 1949. p. 1. Retrieved 15 January 2013. ^ Letter, Eichelberger to Herring, 27 November 1959, Herring Papers, State Library of Victoria MSS11355. ^ Blakeley, Herbert W. (6 May 1943). "The 32d Infantry Division in World War II (General Orders Number 21, War Department)". pp. 130, 131. Archived from the original on 11 January 2009. Retrieved 14 November 2008. ^ Timothy Aumiller, 'Infantry Division Components of the U.S. Army 1917-2004, Tiger Lily Publications LLC, 2004, 75. ^ Toepel & Kuehn 1960, pp. 516–517. ^ Theobald 1964, pp. 615–616. ^ "Organization of The 32nd 'Red Arrow' Infantry Division During the Berlin Crisis". The 32nd 'Red Arrow' Veteran Association. Archived from the original on 16 February 2009. Retrieved 7 February 2009. ^ Sommers, Larry (19 February 2009). "Wisconsin to deploy largest force since WWII". Archived from the original on 25 July 2009. Retrieved 28 October 2009. ^ "Red Arrow Highway Morning". Star. 21 May 2006. p. 12. Archived from the original on 20 November 2008. Retrieved 12 February 2009. ^ ""Thirty-second Division Memorial Highway" Waymark". Archived from the original on 6 June 2011. Retrieved 23 February 2009. ^ "A Little Bit of History" (PDF). p. 37. Archived from the original (PDF) on 17 July 2011. Retrieved 23 February 2009. Toepel, M.G. ; Kuehn, Hazel L., eds. (1960). The Wisconsin blue book, 1960. State of Wisconsin. Theobald, H. Rupert, ed. (1964). The Wisconsin blue book, 1964. State of Wisconsin. Anders, Leslie (1985). Gentle Knight: The Life and Times of Major General Edwin Forrest Harding. Kent, Ohio: Kent State University Press. ISBN 978-0-87338-314-1.